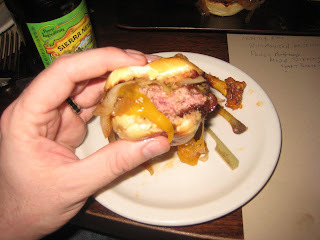 Rare Bar & Grill – Journalistic Burger Integrity Never Tasted So Good! On a cold early day in December, I open my Outlook like any other day and my in box is filled with the days normal to dos, didn’t dos and probably should just forget-abouts and move-ons. But this day was different. Amidst the rubble I found one very special email. No it wasn’t advertising enlargement options, offshore financial gain or sultry temptations (I do have a quarantine program!) 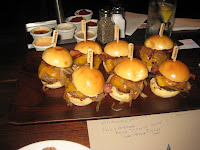 This email contained an invite from Kylene at KB Networks, a well spoken for public relations firm that specializes in chefs and restaurants, for a burger tasting at Rare Bar & Grill. “Oh Br’er Bear, Please don’t throw me in dat briar patch!” Do I want to come taste some burgers? YES I WANT TO COME TASTE SOME BURGERS!! 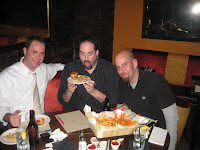 I gathered up fellow foodies Marc the “Bacon Jew” and Jason from Burger of the Month Club and headed up to midtown for the tasting. According to the Rare Bar & Grill website, owners Howard, Ross and Douglas wanted to create an upscale restaurant around an American classic, the hamburger. Located only a couple of blocks from Grand Central Station, Rare can be found attached to the Affinia Shelbourne hotel. 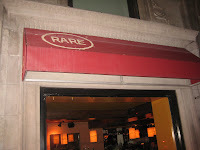 You’ll be as surprised as I was once you enter to learn that Rare has no traditional steaks on the menu as the look and the feel of the place is very NYC Steakhouse. Lot’s of wood, red curtains and a formal, yet laid back atmosphere. You can choose to sit in / at the bar or be formally seated at a table in the back. Burger options range as a wide as chuck, bison, brisket, chicken, tuna, veggie and have a wide array of toppings and preparations. As Jason, Marc and I entered, we were lead to a room in the back of the restaurant. There we met Kylene and Evy from KB as well as staff members of Rare. There were 4 tables with 3 seats each, position facing in each other in a circle. It was as though a gigantic hologram map was about to appear before us as we discussed movement of rebel troops or just an easier scenario to serve and converse. Me, I would like to think of myself as the Luke Skywalker of burgers for this occasion. After a little “hi I am – you are – how are yous – burger shop talk” the food started arriving. They started us off with their “Lollipop Wings,” basically a chicken wing with enough bone to keep your fingers dry along with a side of warm Roquefort fondue. The wings had a really distinct tangy flavor. The sauce was not far from the standard buffalo wing preparation but with a slight hint of orange while not too peppery or hot. They were damn good wings but I could’ve taken a little more heat. As a big fan of the blue cheese family, in fact, for me, the “bluer, the better,” (I.E. penicillin) I love Roquefort cheese! The warming of said cheese loosened it up, making it easier for dipping but had more of a rich Boursin like flavor than a tangy / blue cheese. The ketchup was a good mix of vinegar, tomatoes and sugar but really nothing special (note; I am a ketchup hater). The Mexican ketchup had a little bit of a bite but not enough to make it taste like hot sauce or salsa. A very unique touch. The chipotle aioli on the other hand was really nice. There was a nice smokey overtone to it’s creaminess. I had trouble moving on from it until I tried the roasted garlic sauce. Oh man! So good. 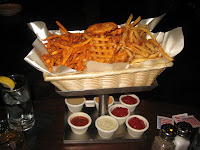 Marc and Jason almost had to pry it from my hands until they were smart enough to tempt me with the combination of sweet potato fries and honey maple sauce. To quote Jason, “this tastes like french toast!” The sugary-salty warm combination was so good that I would actually like to declare this as OK to be served as breakfast, replacing Bill Cosby’s chocolate cake option. The first up on the tasting menu was the “M&M Burger.” This little devilish treat is served medium-rare (is there any other way, really?!?!) flambeed in Makers Mark, topped with caramelized shallots, cheddar cheese and apple smoked bacon. I couldn’t have been more excited to put this in my mouth (that’s what she said) but not nearly as excited as Marc who calls himself a bourbon expert. Little did he know this was coming when he ordered a Maker’s Rocks only a few moments earlier! This greasy little liquored up bad boy was soooo good and so bursting with flavor, that the richness and intensity of the cheddar actually was unnecessary. After a bite or two, I pulled it off the sandwich, and that is coming from a true cheese lover. Once it was off, the true flavors of the bourbon, which was aromatically teasing my olfactory senses, the cut of the meat and the sweet and salty thick bacon all came shining through. Several rounds of “oh my god” came pouring out of our mouths. 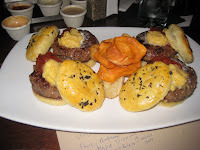 While our mouths we were still salivating from the “M&M Burgers” they showed up with the “Fashion Burger.” It’s made up of 6 ounces of pure ground ribeye, served in a truffled pastry with a dollop of relish, truffle butter, dijon mustard and chips. It took several bites to truly process all that was happening with mix of ingredients. The crispy and flaky truffle pastry was a sweet meets savory taste sensation all its own and gave a distinctly unique edge to this sandwich. 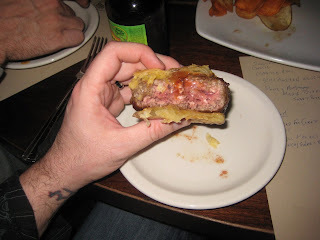 The patty was the most perfectly cooked medium-rare burger I may have ever had the pleasure of eating. That isn’t easy to achieve when A. preparing so many at once and B. in such a small size.! The truffle butter made this thing juice like the lemon running down Led Zepplin’s proverbial leg. It was almost unnecessary but definitely appreciated. I could’ve done with out relish, which I generally dislike and the dijon, although good, was also not needed. The hint of black pepper throughout every bite was awesome. At this point, I thought I was about to either pass out from a meat coma or have my waist line bust apart and I knew that 2nd “M&M” burger was a delicious mistake. 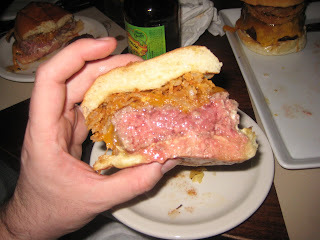 When the “T-Bone Steakhouse Burger” showed up on our table, I began to pray to the meat gods to help me through this. I have no idea how it stood upright as it was stacked so high! It’s a blend of sirloin and strip, flambeed in tequila, wrapped in apple smoked bacon, topped with crispy onions and cheddar. 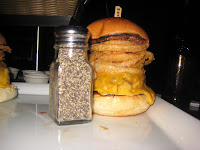 Look at the picture below, it was taller than a pepper shaker. 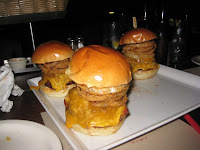 If this is considered a slider or a mini-burger than consider me Wile E. Coyote, ain’t no way! Jason carefully sliced one of these suckers open only to reveal a river of hot burger juice running down the patty and soaking the bun. I wasn’t sure if I needed a 2nd napkin or a set of paddles!! Served on a brioche, this mixed steak meat burger was a divination from the 5th dimension. As a testament to the bread of choice here, it held together even soaked through and through. The crispy onions, which one may think weren’t needed, turned this from a sandwich to a full course. I would argue that they were an absolute necessity in the overall taste results of this burger. The patty was just fantastic. In fact calling it a burger is like calling a house an umbrella, yes it keeps you dry in the rain but it’s so much more. I absolutely loved it. This entry was posted in Bar, Burger Famous, Burgers, Hamburgers, Hot Wings, New York and tagged Affinia Shelbourne hotel, bacon jew, bar, best burger, best burgers in nyc, burger blog, burger club, burger conquest, burger of the month club, cheese, ciancio, david, douglas boxer, french fries, gourmet burger, great burger, hamburger, nyc, Rare Bar & Grill, restaurant, rev, review, sampler. Bookmark the permalink. 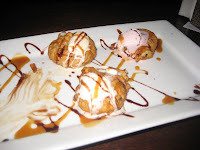 2 Responses to Rare Bar & Grill – Journalistic Burger Integrity Never Tasted So Good! I'm a Bostonian who found himself staying at this particular hotel (the Affinia Shelburne Hill) a few years back. It was a cold & rainy night, and after a long day of working, I had no desire to go out & enjoy the greatness of NYC. So I went down to the lobby and sat at the bar at Rare. I still remember that "M & M" burger as one of the best I've ever had, anywhere. 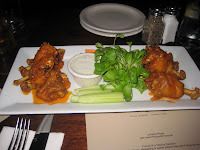 Got it w/ Sweet Potato fries, and also had the chicken wing lollipops to start. I've always wondered why this place doesn't get the love from other popular burger blogs, but am happy to see it here this morning. When I got the email from Rev asking if any of us wanted to join…I'm replied "yes" without blinking an eye. I had been to RARE before, probably a couple years ago, and remembered really liking it a lot. Everything Rev described above pretty much matches my thoughts. The M&M; in slider form is something I hope that Rare ends up doing – I can see people ordering those in addition to a regular burger for dinner. My rankings are the same as above: #1 M&M; #2 Fashion #3 T-Bone. The one thing that would make the Fashion better was to have it in some kind of holder since it was so greasy. 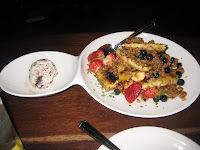 But that being said, it by far had the best meat of any of the three…the M&M; took the crown with the overall package.